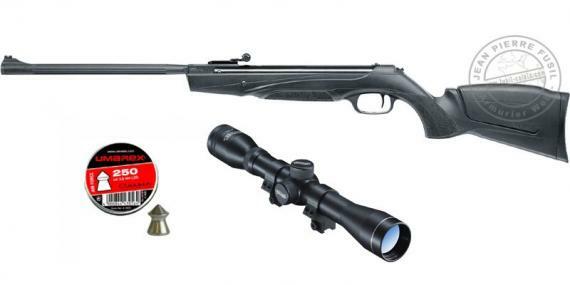 A very small price for this airgun Hammerli Black Force 880, made by Umarex, delivered with a scope and a box of 250 pellets. Proposed in .22 rifled bore, it is idela for "mobile" shoots or plinking, and will drill at leisure cans, tins and any targets at its reach! The .22 bore for averybody : this Hammerli Black Force 880 develops a power of 16 Joule, staying thus in D category, sold to any people over 18 years old, without any declaration. Behind a modern look, with soft shapes, hides a powerful, accurate and qualitative. Its stock, made of molded polymer, is ambidextrous, and has non slip textured surfaces, for an excellent handling. The barrel, steel rifled, is also covered with polymer, to be extremely weather and soil resistant. The Black Force 880 works thanks to a classic spring that, expanding, prepels the pellet at a velocity of 625 Fps. This one shot airgun is break barrel cocking, pulling it down at 90°, and then takingit back up. The pellet is simply inserted in the barrel, before closing it. It has an automatic safety system, avoiding inopportune shots, that can be removed at the las moment, with a pressure of the thum on the back of the barrel. The sights have bright optic fibers (green and red), allowing an easy and helped shooting at eye. The rear sight is ajdustable in windage and elevation, to be adapted at the shooter. It also has a dovetail rail of 11mm, to allow longer range shooting, mounting a scope or any other opics accessory.